Blog> How Did Electric Cars and Smartphones Trigger the New Gold Rush? What most of us probably don't take into account is that it is the abundance of materials that make modern life possible, for example, technology products such as smartphones, electric cars, large-screen TVs and green energy generation depends on a range of chemicals that most people have never heard of. In fact, a mobile phone contains more than a third of the elements in the periodic table. As demand for these high-tech products grows, so does the demand for the key manufacturing elements of these products. However, the supply of these elements is affected by a range of political, economic and geographical factors and their prices will fluctuate accordingly, which makes the investment in mining these metals a risky business. Here are a few examples of prices that have soared over the past few years. Cobalt is one of the key components of the superalloy of modern jet engines and the batteries that power our phones and electric cars. Over the past few years, demand for electric cars has grown rapidly, with global registrations more than tripling from 200,000 in 2013 to 750,000 in 2016. 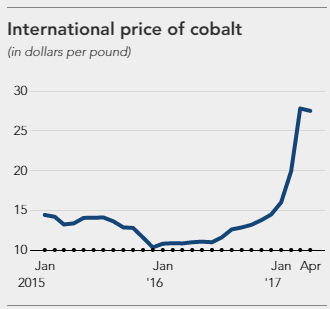 Apart from the demand from traditional industries, this has helped raise cobalt prices from 15 pounds per kilogram to nearly 70 pounds per kilogram over the past three years. Rare earth contains 17 metallic elements, which usually by-products of large-scale mining of iron, titanium or uranium. The prices of different rare earth vary and fluctuate greatly. Neodymium oxide, for example, peaked at 93 pounds per kilogram at the end of 2017, driven by growth in electric cars and wind power, which was double the mid-2016 price and then fell back to about 40 percent higher than in 2016. Indium is one of the rare metals on earth, but you'll probably see it every day since all tablets and touch screens rely on a very thin layer of indium tin oxide. The element is mainly produced as a by-product of the zinc mine, and obtaining 1 gram of indium may require mining 1,000 tons of ore. Although indium is rare, it remains an important part of electronics because there are no other elements that can be used to make a touchscreen. However, scientists hope that the two-dimensional form of carbon known as graphene could provide a solution. After a sharp decline in the price of indium in 2015, the market price of indium in 2016-17 has risen by 50% to around 350 pounds per kilogram, which is largely due to its use on the tablet screen. Tungsten is one of the heaviest elements, twice as dense as steel. In the past, we used to rely on it to light up our homes, which was the fine tungsten wire used in the old incandescent bulbs. Even now that LED lights have almost replaced tungsten lamps, most of us are still exposed to tungsten-related products every day. For example, tungsten along with cobalt and neodymium allows our phones to vibrate, and these three elements are used to rotate the motors in our phones to create vibrations. Tungsten, combined with carbon, or tungsten carbide, is widely used as a cutting tool in the manufacture of metal parts in aerospace, defense, and automotive industries. It can also be used to make wear-resistant parts for drilling machines for oil and gas extraction, mining and tunnels. Previous: How Can Nano Tungsten Disulfide be used today?